A range of great Amarone going back twenty three years. Mr. Amarone, Sandro Boscaini, president of Masi, specialists in all things appassimento, put on a great tasting this afternoon. It was Sandro’s father who first dreamt up the idea of Ripasso in the late 1950’s, making the first commercial vintage in 1964. Some years later, he offered the name to the local Chamber of Commerce, thus allowing other producers to use the term. He is not entirely happy with the current standards (some use the dried grapes three times – the result he says is a bit like a teabag; it gets lighter each time). However we were tasting Amarone. 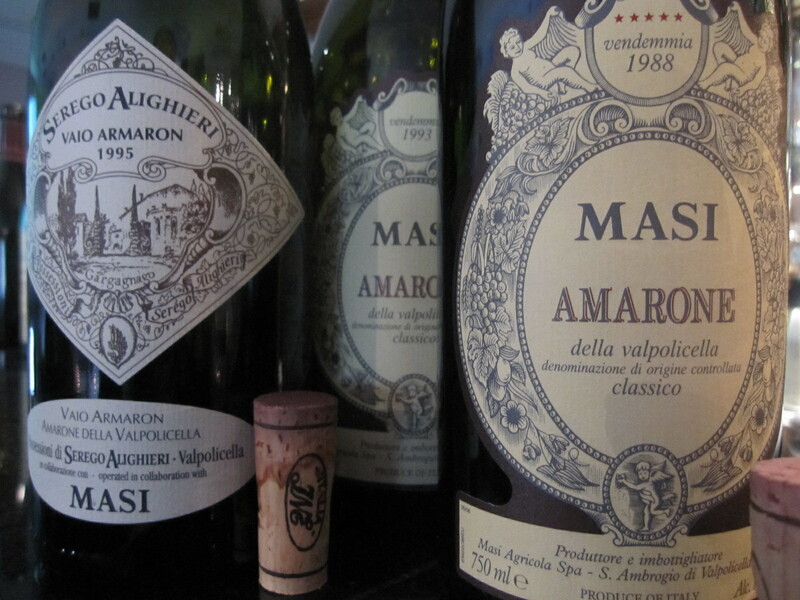 We tried eight wines, including six of the Masi Costasera, their ‘standard’ Amarone, and two vintages of Serègo Alighieri Vaio Amaron, from the ancient estate of the family of Dante Alighieri. It was a really good reminder that high alcohol wines can be perfectly balanced; also that Amarone, a much abused name, is a great wine. Some really good, and two absolutely stunning wines.